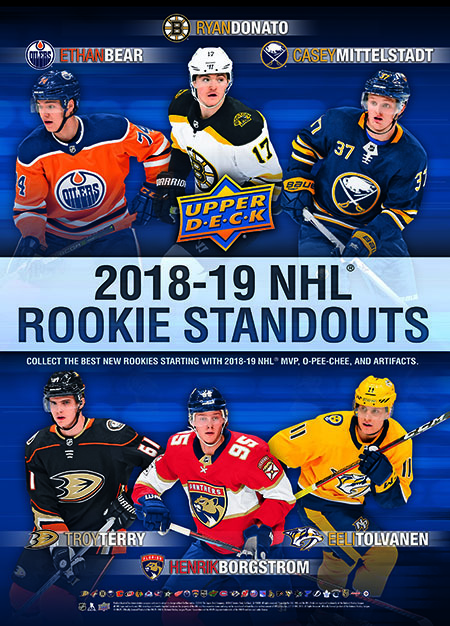 Once the Stanley Cup has been won, the NHL® Awards have been handed out, and a legion of prospects hear their names called out on Draft Day, hockey card collectors are on the hunt for something to get excited about between the free agent frenzy of early July and the start of the next training camp in September. 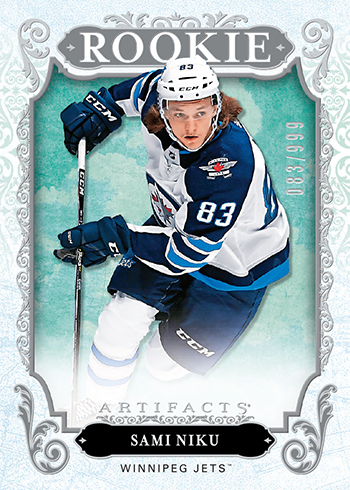 This is where Upper Deck comes in to save the day with the 2018-19 NHL® MVP – the first hockey card release of the new season. A hobby mainstay with 20 years of tradition behind it, MVP has marked the arrival of newly-minted rookie cards of some of the best players that debuted in the last few months. 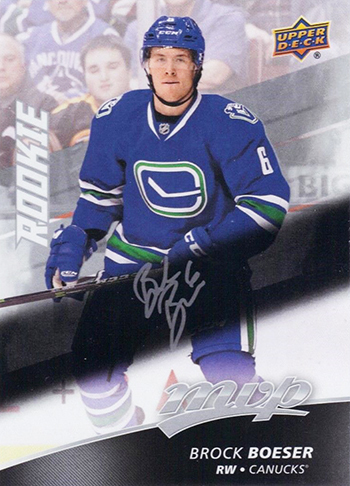 In the past, there have been some big names that have had to wait a little bit for their rookie cards thanks to late-season arrivals such as P.K. Subban, Johnny Gaudreau, and William Nylander. Even a few members of the most recent crop of elite rookie performers played their first NHL® games during the latter stages of the 2016-17 campaign – including Calder Trophy finalists Brock Boeser of the Vancouver Canucks and Clayton Keller of the Arizona Coyotes. Over the course of the 2017-18 regular season, 139 players hit the ice for the first time and a few more goalies sat on the bench waiting for an opportunity to get in on the action. 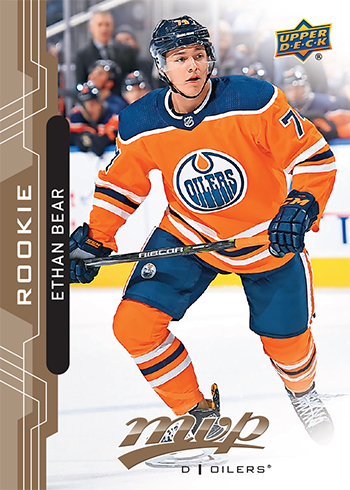 While over half of them were able to make it into Upper Deck’s broad lineup of hockey card offerings, there were over 50 that made their debuts after January’s rookie card deadline. That all benefits the collectors as now these “carryover rookies” will appear in the first products of the year and throughout the season. 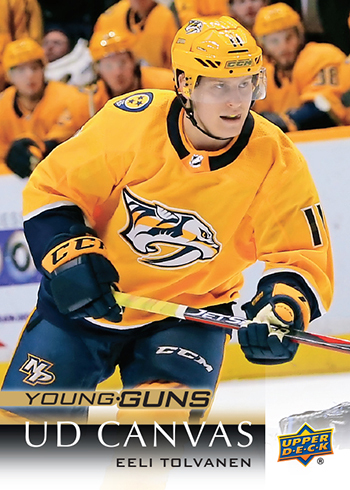 This season’s carryover rookies are an impressive group loaded up with some potential Calder contenders – headed up by prime prospects like Casey Mittlestadt, Eeli Tolvanen, and Ryan Donato. There is a mix of high draft picks, late-round sleepers, and hobby dark horses who will be on want lists once the puck drops in October. 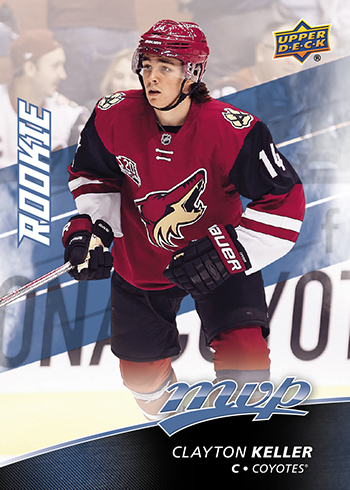 With the release of 2018-19 NHL® MVP this summer, many of these carryover stars in the making will be popping out of packs for the first time. Let’s get to know some of the before their cards hit hot lists around North America. Worthy of note, some of these prospects have a variety of content in Upper Deck’s Team Canada World Juniors, AHL and CHL products. Make sure to check those out as well! 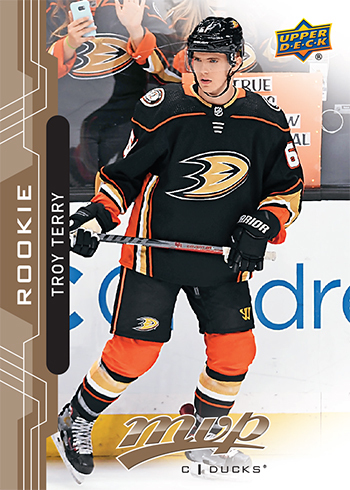 A fifth round steal for the Ducks in the 2015 NHL Entry Draft, Terry is coming off a fantastic 2017-18 campaign where he not only led the University of Denver to the NCHC title but also played for the United States at the 2018 Winter Olympics. Over 39 games for his school, he put up an impressive 48 points and made his professional debut against the Vancouver Canucks on March 27. Fans in Anaheim are going to like Terry’s speed and ability to create scoring chances. He has a great chance to make the team next season. 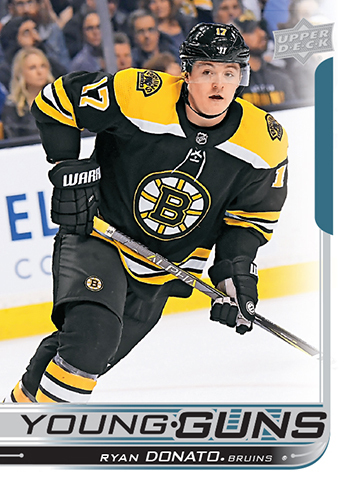 Young Guns rookie cards release in 2018-19 Upper Deck Series One in November. Another member of the American Olympic squad to make his NHL debut this season, Donato is a second-generation player that has made a strong impression with fans in Boston. A late second round pick back in 2014, he was able to develop at his own pace while playing for Harvard and was a Hobey Baker Award finalist this year. With the world watching the action from Pyeongchang, he had a tournament-leading five goals and his offensive spark did not fizzle upon making the Bruins. 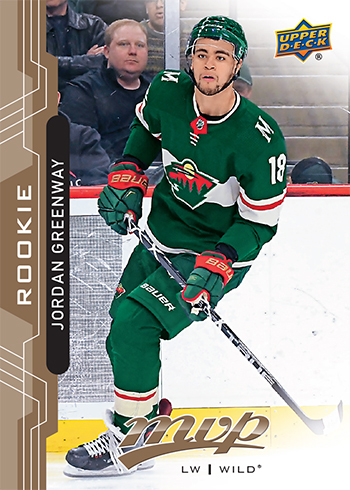 Black Diamond releases in December with a variety of unique rookie content. His father, Ted, played over 500 games for the same team and Donato is looking like a fine heir to the family business. Over his first 12 games, he recorded nine points – including a goal and two assists in his first outing that came versus the Columbus Blue Jackets on March 19. 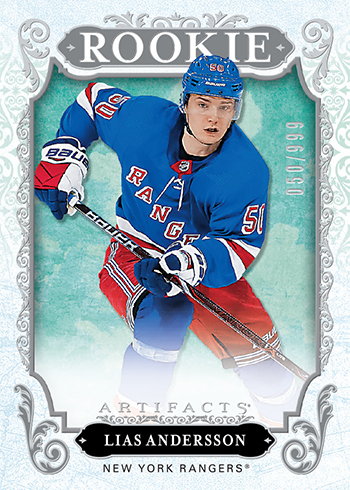 Artifacts is a great product that fans look forward to coming out in early October. 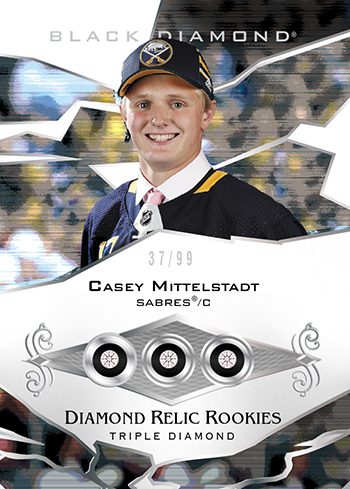 The Sabres have amassed a great group of young prospects in recent years and Mittlestadt is regarded as one of the franchise’s key components in their planned return to playoff contention. The eighth overall pick in 2017, he is regarded as a complete package due to his fantastic skill set and is not afraid to try to set up a complicated play. A former Minnesota Mr. Hockey as the state’s High School Player of the Year, he stayed close to home for his lone season of collegiate action with the University of Minnesota and averaged nearly a point per game. Diamonds in a trading card? This rookie really shines! While hitting NHL ice for the first time on March 29, he recorded an assist in a 6-3 loss to the Detroit Red Wings. He lit the lamp for the first time a little over a week later in a wild-7-5 defeat at the hands of the Tampa Bay Lightning – putting the puck past Vezina Trophy finalist Andrei Vasilevskiy. 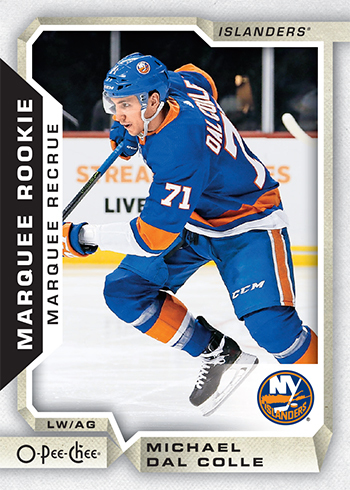 O-Pee-Chee releases in early September and will have a variety of carryover rookies included! It is always nice to see a sixth round selection pan out and the scouting team for the Blackhawks once again found a hidden gem in Sikura. 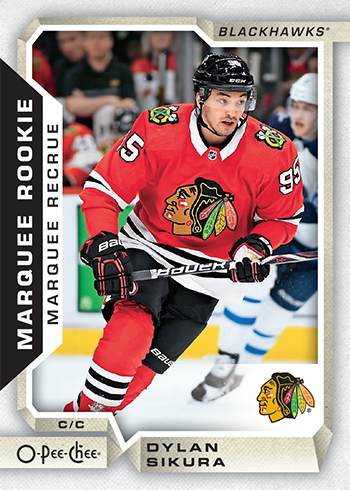 Following four seasons at Northeastern University where he finished up as both a First Team All-American and Hobey Baker nominee, he got a brief taste of NHL action with Chicago. His first game back on March 29 was certainly a memorable one as he notched a pair of assists while playing alongside super rookie Alex DeBrincat during a surprising 6-2 win over the Winnipeg Jets. On top of all that, he also helped Canada to victory at the Spengler Cup. 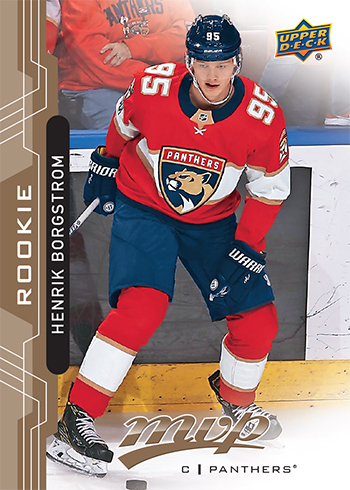 After dominating the Finnish junior ranks, the Panthers snapped up Borgstrom with the 23rd pick in the 2016 NHL Entry Draft and he quickly came over to North America to star for the University of Denver. The NCHC’s Rookie of the Year in 2016-17, his high-scoring ways made him one of the best young talents at the collegiate level for the past two seasons. On March 29, he suited up against the Ottawa Senators and made decent impression as the season drew to its conclusion. 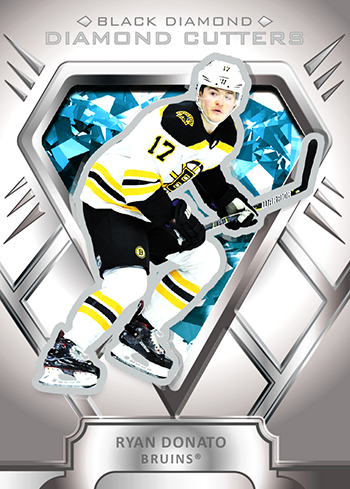 On the last day before the playoffs were set to begin, he opened up the scoring on the road against Tuukka Rask of the Boston Bruins. The hottest prospect in an organization that already has some solid youngsters like Owen Tippett, he could play a role in helping the team back to a playoff spot. Greenway is already familiar with how important hockey is to folks in Minnesota as he is an alumnus of the widely-respected Shattuck St. Mary’s school. 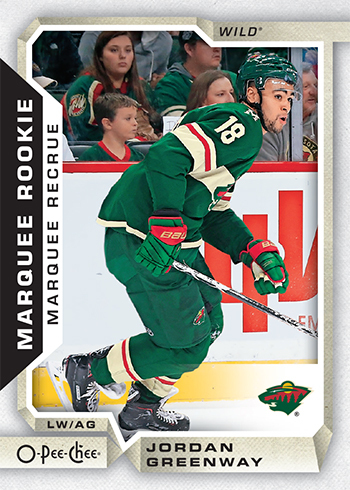 Following a stint with the U.S. National Team Development Program, he was a second round acquisition by the Wild in 2015. This connection is bound to generate interest from local fans. Soon after, he went to Boston University for a strong three-season run that saw his offensive output increase steadily and his final campaign was marked by a Hockey East Third All-Star Team selection plus a stint with the American Olympic squad. Kept off the scoresheet during his first five NHL games, he chipped in an assist during the regular season finale against San Jose. In the playoffs, he got a respectable amount of ice time and his first pro goal helped secure Minnesota’s only victory in the first round clash with Winnipeg. The buzz on Tolvanen has been intense for quite a while thanks to some highlight reel plays while playing for Jokerit of the KHL. The 30th overall choice in the 2017 NHL Entry Draft has been busy throughout the 2017-18 campaign as he also represented Finland at several international tournaments – including the Winter Olympics and the IIHF World Junior Championship. 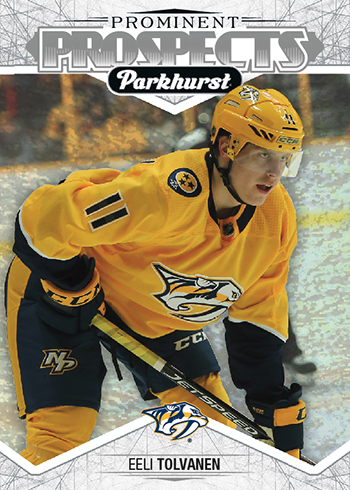 Parkhurst is a Wal-Mart exclusive that has grown in popularity every December it has been released. A two-time KHL Rookie of the Month, Tolvanen joined the Predators for the three games late in the season before joining his countrymen for the Worlds. 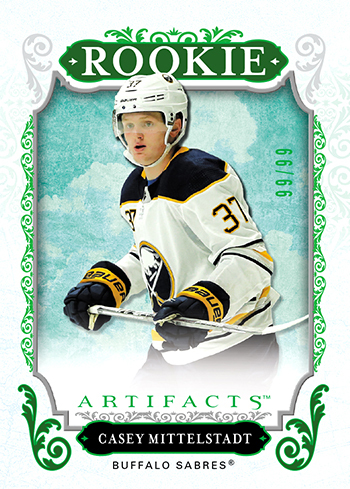 He is regarded as an early competitor for the Calder Trophy and could quickly emerge as a collector favorite. Andersson wore several different jerseys throughout the past season and found himself going all over the globe playing the game he loves. 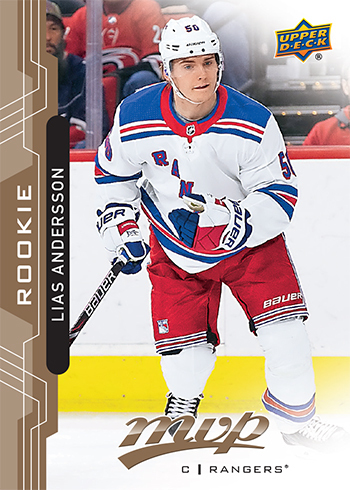 Picked seventh overall by the Rangers in 2017, he starred for Frolunda in Sweden in addition to taking to the ice for several tournaments. While his decision to toss away his silver medal into the crowd at the World Juniors polarized hockey fans, there is no doubt that he is an intense competitor. Still a teenager once the season begins, this hard-shooting speedster could develop into a solid role player in time and he already plays a strong two-way game. Playing in a big market will help bring attention to him as well. 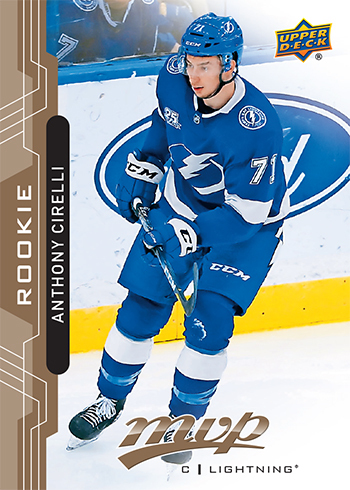 Cirelli made a successful jump to the pro level in 2017-18 and looked great in action with the AHL’s Syracuse Crunch and finished among the top 25 rookie scorers despite only playing 51 games there. Called up to the Lightning for their March 1 match with the Dallas Stars, he made a big impact with a goal and an assist. By the end of the season, he had 11 points in 18 games. With Tampa Bay going deep into the playoffs, Cirelli has received plenty of exposure to both fans and collectors. He had a late empty net goal in Game 4 of the Eastern Conference Final to help his team even up the series with the Washington Capitals. 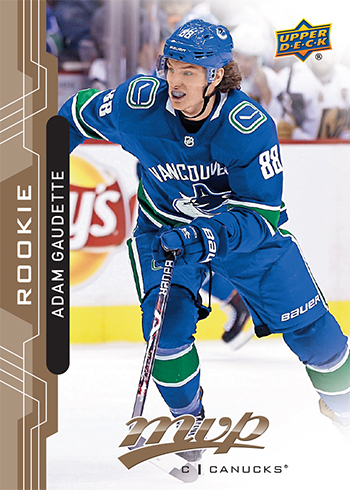 With the retirement of Daniel and Henrik Sedin, Canucks fans are ready to embrace a new generation of players and Gaudette is an excellent competitor that could gain a strong following in Vancouver and beyond. Over four seasons with Northeastern University, the former fifth round pick (149th overall in 2015) emerged into one of the game’s top prospects. Last season, he was awarded the Hobey Baker Award thanks to a 30-goal, 60-point effort that led all NCAA players. During his first five NHL games, the Canucks were not defeated in regulation time and his debut came on home ice when the Edmonton Oilers came to town on March 29. 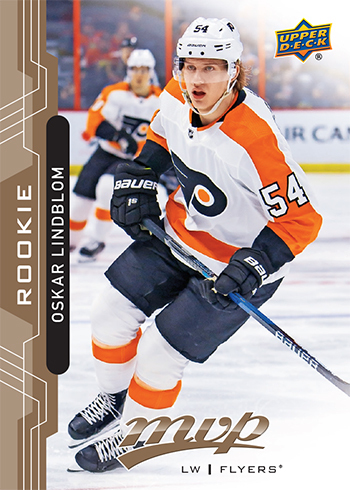 Fans in Philly got a finally got a brief glimpse of Lindblom this year and the former Swedish Forward of the Year looked great while skating for the AHL’s Lehigh Valley Phantoms. 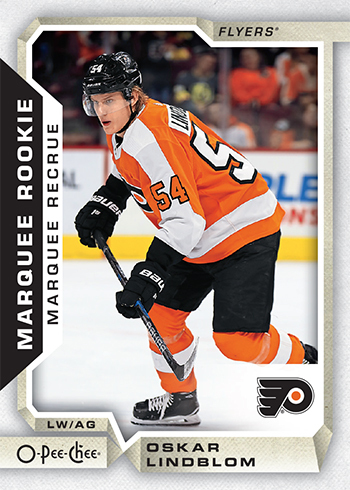 Called up to the Flyers in late February, it took him 13 games to register a point. After that, the offense started to get going and his first goal was registered against the Washington Capitals on March 18. If Lindblom makes the big roster out of camp, there could be a lot of attention as he breaks out into one of the team’s offensive catalysts. A fifth rounder in 2014, he exhibits a lot of potential and has put up great numbers in the Calder Cup playoffs – including a pair of two-goal outings. Some other prospects to watch out for from the 2018-19 carryover rookie class include Michael Dal Colle (New York Islanders), Zach Aston-Reese (Pittsburgh Penguins), Justin Holl (Toronto Maple Leafs), Ethan Bear (Edmonton Oilers), and the AHL’s reigning Best Defenseman Sami Niku (Winnipeg Jets).